← Weekly Update 7/27/2018 – Foreign Stocks Shine, Technology Tanks U.S.
Earnings season rolls along. The current earnings season has been marked by very strong growth, limited upside, and resilient estimates. With 265 S&P 500 index companies having reported, earnings growth is tracking to a solid +22.6% year over year, about 2% above June 30 estimates, with an impressive 82% of companies having beaten estimates. Revenue growth is tracking to +8.7% year over year, already a 0.6% upside surprise, with an also impressive 72% of companies beating forecasts (both beat rates are well above recent and long-term averages). Forward four quarter S&P 500 earnings estimates, which typically fall during reporting season, have risen 0.4% since June 30, suggesting tariffs have not had any meaningful broad impact on companies’ outlooks. 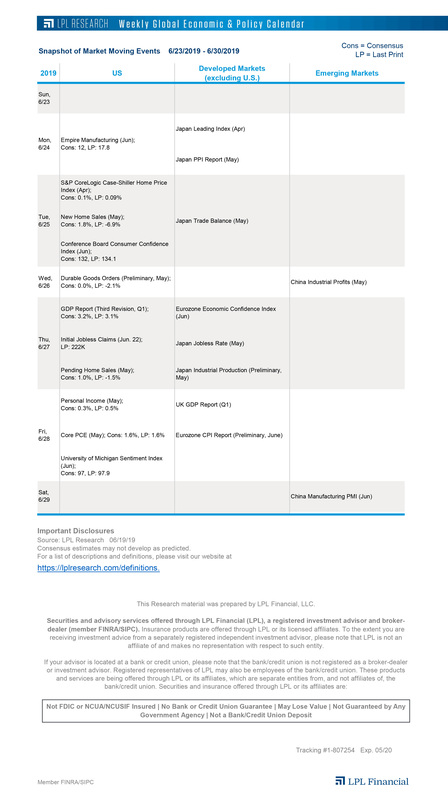 Busy week for economic releases. It’s a busy week on the economic front, which could introduce volatility into U.S. stocks. A June report on core personal consumption expenditures, the Federal Reserve’s (Fed) preferred measure for inflation, is scheduled to be released on Tuesday, along with data on consumer confidence and personal spending. Manufacturing reports from Markit and the Institute for Supply Management are due on Wednesday, while weekly jobless claims data is scheduled for Thursday. Finally, June’s non-farm payrolls report will be released on Friday. Fed meeting week. Though fed funds futures are pricing in an 82% probability that the Fed keeps rates stable when it holds its two-day meeting on Wednesday and Thursday, there’s currently a 72% probability that the Fed increases interest rates at least two more times this year so investors will be watching closely for any indications that the outlook has changed. Bank of Japan. The Bank of Japan’s (BOJ’s) next monetary policy decision will be released on Tuesday. Global bond yields have climbed over the last two weeks on reports that the BOJ is reportedly looking for ways to make its policy more sustainable (as it has been costly to peg their 10-year government bond yield near 0%). Investors will be looking for any changes to nuance or language around the BOJ’s monetary policy, even though no actual changes are expected. Go Active? Active manager headwinds are turning to tailwinds, which may bode well for active managers, the topic of this week’s Weekly Market Commentary due out later today. For a number of reasons, including market distortions from central bank bond purchases, high correlations between individual stocks, and the cyclical strength of the stock market, over the past several years it’s been difficult for active managers to outperform equity benchmarks. But the tide has started to turn, with central banks pulling back and correlations between individual stocks falling, which we believe sets active managers up for better relative performance potential in the years ahead. August and September are for the bears. The S&P 500 is poised for a fourth straight monthly gain as its surprise summer rally continues. However, August and September are two of the weakest months historically. Today on the LPL Research blog, we examine the factors behind this seasonality and re-visit our expectations for volatility and S&P 500 returns this year.